The IT landscape is constantly evolving as businesses benefit from a variety of IT infrastructure advancements. One of the fastest growing developments is edge computing, which takes compute and storage capabilities to the edge of our networks to capture and process data in realtime. 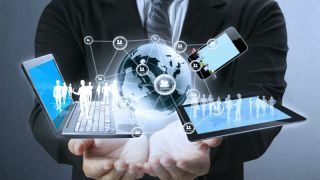 As distributed enterprises become more sophisticated, the always connected world requires sophisticated IT, normally only found in centralised data centres. Today’s IT landscape is all about micro data centres at the edge that offer superior latency and performance for quick and instant access to data. So what is edge computing? Edge computing refers to computing that takes place outside of the centralised data centre, typically this means bringing IT infrastructure closer to where data is being created and used as retailers with hundreds of locations. Using a small hardware footprint that combines storage and compute capabilities at the edge enables organisations to collect, process and manage vast quantities of data exactly where the users are, and then can uploaded to a centralised data centre or the cloud. Edge computing also acts as a high performance bridge from local compute to both private and public clouds. Retail - With dozens or hundreds of retail locations, retailers need reliable computing across the edges of their networks. Apps for PoS, inventory management, security, and more need maximum uptime. Industrial - Manufacturing and other industrial processes can span across multiple sites with high-tech computing needs for equipment and personnel. Industrial IoT devices like sensors require on-site computing performance. Finance - Banks and other financial institutions have multiple branch offices, which require reliable computing to execute rapid, business-critical transactions. ROBO - Any remote office or branch office locations at the edge of the network require computing resources that keep productivity online. Mobile platforms - Shipping vessels, ocean liners, offshore platforms, defense, and remote construction have computing needs that can go beyond the edge of most networks. Mobile systems need to be autonomous, not-reliant on stable external networks connections. Edge computing is playing a prominent role in the continuing deployment of IoT devices as the most effective means to process the vast amount of data they produce quickly and effectively. Organisations don’t have time for IoT data to travel to and from the cloud. They need quick and instant access to data, which is where edge computing comes into effect. Sending and retrieving data to and from the cloud brings with it a time delay and there are rising concerns over connectivity. By analysing data at the edge of the network, organisations can deliver the real time performance these applications need. However, with many applications running on the edge becoming as critical as those in the data centre, how can organisations match the resiliency, scalability, security, high-availability and human IT resources found in the data centre? How can they address the growing mismatch between the importance of the applications and the infrastructure and IT that supports them at the edge? To support critical applications with little or no onsite IT staff, edge computing systems have to be reliable, easy to deploy and use, highly available, efficient, high performance, self-healing and affordable. In many instances, to keep applications running without dedicated IT staff onsite, systems require automation that eliminates mundane manual IT tasks where human error can cause problems. Automation also keeps the systems running by monitoring complex system failure conditions and by taking automatic actions to correct those conditions. This eliminates downtime shifts application workloads to redundant hardware components to continue operating. Organisations with hundreds of sites cannot afford to spend weeks deploying complex hardware to each site. They need to be able to plug in the infrastructure, bring systems online and remotely manage the sites going forward. The more complex the infrastructure, the more time they will spend deploying and managing it. Edge computing systems need to be self-healing to provide high availability for applications without requiring IT staff resources, with automated error detection, mitigation and correction. Management tasks should be able to be performed remotely and with ease. In addition, these systems should be scalable up and down, dependent on the requirement of the edge location, to ensure organisations are not saddled with excessive overheads for resources they don’t need. Hyper converged infrastructure can help organisations deploy the compute, storage and network resources at the edge in dispersed locations. The data centre in a box approach makes it easy to deploy IT infrastructure that can be managed individually or centrally, to add additional resources without downtime, to deliver built-in self-healing, local high-availability, remote disaster recovery and hybrid cloud capabilities. These systems can be deployed in minutes and preconfigured to avoid lengthy on-site resources during initial deployment. No specialised training or certification is required because these platforms are designed to be powerful but intuitive, which also negates the need for on-site IT expertise. Edge Computing is an infrastructure component that is getting more attention as IT continues to grow and encompass every area of business and operation. But it’s important that organisations implement technology that makes this accessible and affordable in order to reap the benefits that edge computing make possible.